Hey guys, I'm Icecastle. I've played the games for 68 days and finally reached 20 million+ might today. I only bought 3 30-day supply bundles and 2 $5 Gryphon bundles. I wanna share some experience with you. Hope it can help you get started quickly. You need to level to Castle 17 as fast as possible for unlocking Tire 3 troops. So just focus on upgrading related buildings. Before you can build T3 troops, I would recommend you to train as much Ballista as possible and just skip T2 troops. As the most cost-effective troops for gathering, Ballista will always be the last one to get wounded and can be healed immediately. When you reach Castle 17. Congrats! It's just the beginning of the game. And you can stop at Castle 17 around 2 weeks as the Hell Event is much easier to complete at this stage. Hell Event will give you a lot of speedups and gems. You can complete at least 6 research hell events by unlocking Royal Guard, Fire Trebuchet, Stealth Sniper, Royal Cavalry and upgrading construction speed and monster hunt. During the period, you can upgrade most of your manors and infirmaries to lvl17. I would recommend you to build 1 barrack, 5 infirmaries and the rest for manors. Keep 2 of the manors at lvl10, because later you may need to demolish them and build more infirmaries. If your training speed reaches 200% and above, you can consider whether to train soldiers with speedups or not. I accumulated a lot of gems and speedups from hell events. Then I focused on building castle related constrictions and rushed to Castle lvl21 from lvl17 in one day with speedups. At this stage, you should check out the hell events from time to time and finish some of them by upgrading Army Defense, Army Offense, and Army Health to lvl7. Don’t rush to Castle 24, save your gems and speedups for research hell events that only ask for 280k points or lower. After reaching Castle 24, it took me around 20 days to upgrade 9 buildings to lvl24. By completing various hell events, I accumulated 80k gems and 45 days of speedups. When construction hell event came, I bought 5 gold hammers to upgrade my Castle, Mines, and workshop to lvl 25 so I can unlock the third accessory slot. Then I just focused on upgrading all my infirmaries and manors to lvl25. As an ‘F2P’ player, I just focused on building ranged troops. For heroes, I would recommend Tracker, Prima Donna, Snow Queen, Child of Light and Trickster. These heroes perform well in Colosseum and heroic adventures. Wanna know more about Lords Mobile? Wanna be a contributor of Lords Mobile guides? Wanna increase your might faster? Download WeGamers for more guides and bundles. 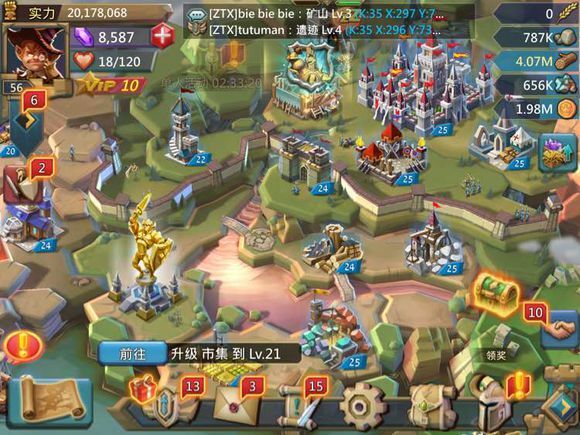 Previous Previous post: Lords Mobile: How to Reaching Tier 20 In Guild Fest.